The Whoa Nellie Deli (whoanelliedeli.com) is situated inside what is locally called “The Mobil” in Lee Vining, CA. Nothing they sell at the place, gas or food, is inexpensive, but there’s a lovely outdoor eating area, a view of Mono Lake, and to be fair and honest, the gas is actually cheaper than at the other nearby station in downtown Lee Vining.We took our food to go, gassed up, and pressed on–not directly into Yosemite, but instead just a few minutes north to the US Forest Service Mono Lake Visitor’s Center. We ate our lunch out on the deck there, taking in the fresh mountain lake breeze and the sunlight. The young ones were a little hard to control, but they deserved a little run-around time. The Visitor’s Center seems fairly new and was only lightly trafficked while we were there. The view from our lunch spot is fantastic–check the panoramic shot on Google Earth at N 37 58′ 01.37″, W 119 07′ 11.51.” And then, uh, imagine that in color. Who posts a 360-degree shot like that in black and white, anyway? Refreshed, we climbed back into our speedy little Stuttgart cocoon and struck out for Yosemite. We hadn’t even gone through the gate yet when we passed Ellery Lake, elevation 9,472′. The scenery doesn’t need the altitude’s help to be utterly breathtaking. The colors, the air, the water–everything about the place is mind-piercingly crisp. I desperately wanted to just sit there and stare at it for hours, but we had to keep moving. 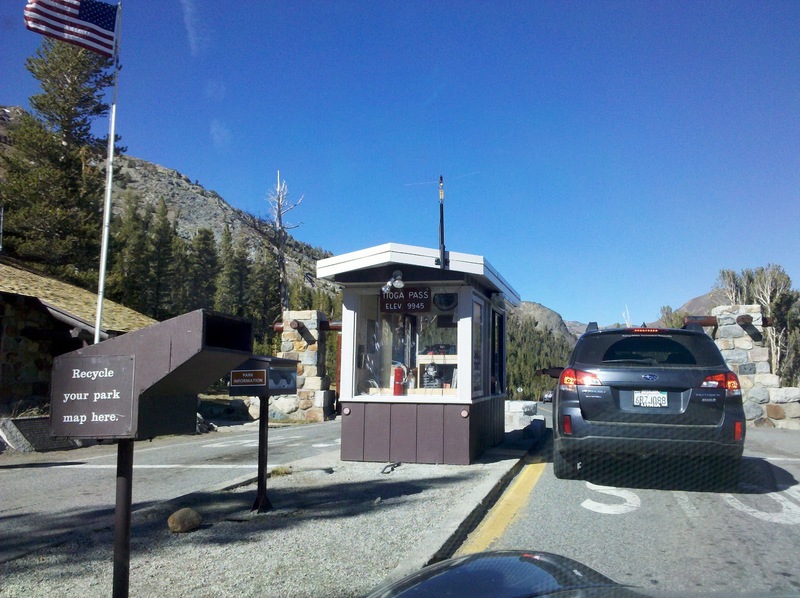 At the gate to Yosemite National Park, we handed over the $20 entrance fee, which would suffice for both the “to” and “from” legs of our trip, as the receipt is valid for a week. The Park Service employee was the first to comment on the carrying capacity of the 911, remarking, “Wow, I guess you guys decided to forget the minivan!” “Bah, who needs it,” was my grinning reply. She smiled, but that was probably because she was loopy from long hours of working at 9,945′ elevation. Just a magical shot, with smooth, even lighting, taken by my lovely wife. We exited the park on CA-140 as the sunlight began waning. The road wound on endlessly through the darkening wilderness. Just as the natural light relinquished its last foothold on the landscape at around 7pm, we popped out into Mariposa, a surprisingly vibrant little town on the west side of Yosemite. My cursory overview of it on Google Maps and Earth had not prepared me for just how jumpin’ the place would be on a Thursday evening in October. Lights were on, shops were open, restaurants were bustling with hungry patrons. The wife and I both remarked on the state of the place and how nice it would be to stay there sometime, when we had more time to explore the great national park we’d just rushed through. And we kept on going into the night. The goal was to arrive at our hotel before 11pm, when the hotel’s front desk would close. A stop in was in order to get #1 and #2 ready for the night portion of the drive. We stopped at a CVS in Merced, CA to stretch our legs, dispose of trash, and get the kids some milk, which would hopefully put them to sleep. We were all getting a little tired but could taste our destination now, just over two hours away. Through Los Banos, past Hollister, around the hills and through the fields, we hurtled through the noticeably more-humid-than-desert California night. There was only light traffic and the roads were flat and straight, making for easy driving on this last leg. We cruised into Monterey just after 9pm and were checked into our hotel by 9:30. I took the 911 back out on a quick solo trip for a fast food dinner and drugstore supplies, then shut her down for the night just outside the door to our room. It had been a long, but exciting and eventful day. We were tired, but eagerly anticipated the morrow.